'The Protagonist' is a charming, original homage to the good old days – AiPT! A parody of and homage to the Golden Age of comics, told in the manner of a classic Nicktoon. Stop me if you’ve heard this one before: a scrawny, nerdy teenage loser by day dons a mask and a cape and becomes a virtuous do-gooder by night. It’s only the most rote, paint-by-numbers superhero origin ever, right? All that’s missing is the dead parents. 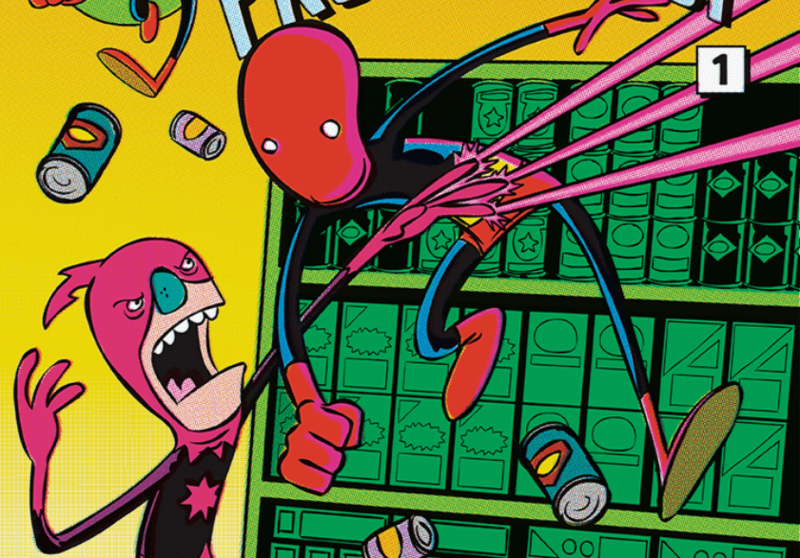 That’s the gist of Brendan Tobin’s The Protagonist, but its basic premise is largely the point in this funny and surprisingly original satire of the superhero genre on the whole. The Protagonist is the result of a comic book contest from Pulsar Entertainment, in which writer/artist Brendan Tobin came in second place. It was described to me as heavily inspired by Stan Lee and Steve Ditko’s Spider-Man, and that’s spot-on. The Protagonist is at once a parody of and an homage to the classic era of comic books, providing some laughs and definitely keeping you entertained. Mild-mannered teen Palmer has a secret: he’s also The Protagonist, "costumed crimefighter and do-er of general good." In the short, eight page comic, the aptly-named Protagonist faces off against the bombastic Beam when attempting to procure canned prunes for his grandparents. I won’t spoil it (seriously, it’s eight pages, just go read it), but the story is hardly the main attraction here. The Protagonist is dense with dialogue and narration and even denser with laughs and in-jokes that skewer the Golden Age of comics. The book even starts with a mock advertisement that describes itself as "yet another parody of that old advertisement." Whoa, meta. Both the humor and the art style remind me of Nicktoons like Rocko’s Modern Life and The Ren & Stimpy Show. The Protagonist himself is like the lovechild of Rocko‘s Really Really Big Man and Peter Parker. He’s the opposite of Butters’ alter ego Professor Chaos in South Park — a wimpy kid who uses his masked identity as an outlet his real life can’t provide. The artwork is pretty simplistic, but has a very distinctive style that, again, evokes classic cartoons of the early 1990s. The colors, while simple, are quite nice and very vibrant, giving the book that Golden Age feel. If you’re in the mood for both something original and a throwback to the good old days, The Protagonist is for you. While its premise sounds like it’s been a thousand times before, Brendan Tobin breathes new life into the idea, providing a genuinely funny and enjoyable experience. You can read The Protagonist online for free through Pulsar Entertainment. You can also check out Brendan Tobin’s latest work on his blog.